CT, or CAT scans, are special X-ray tests that produce cross-sectional images of the body usingX-raysand a computer. CT scans are also referred to as computerized axial tomography. CT was developed independently by a British engineer named Sir Godfrey Hounsfield and Dr. Alan Cormack. It has become a mainstay for diagnosing medical diseases. For their work, Hounsfield and Cormack were jointly awarded the Nobel Prize in 1979. Picture of CT scan machine. CT has revolutionized medicine because it allows doctors to see diseases that, in the past, could often only be found at surgery or atautopsy. CT is noninvasive, safe, and well-tolerated. It provides a highly detailed look at many different parts of the body. If one looks at a standard X-ray image or radiograph (such as achest X-ray), it appears as if they are looking through the body. CT andMRIare similar to each other, but provide a much different view of the body than an X-ray does. CT and MRI produce cross-sectional images that appear to open the body up, allowing the doctor to look at it from the inside. MRI uses a magnetic field and radio waves to produce images, while CT uses X-rays to produce images. Plain X-rays are an inexpensive, quick test and are accurate at diagnosing things such aspneumonia,arthritis, and fractures. CT and MRI better to evaluate soft tissues such as the brain,liver, and abdominal organs, as well as to visualize subtle abnormalities that may not be apparent on regular X-ray tests. People often have CT scans to further evaluate an abnormality seen on another test such as an X-ray or anultrasound. They may also have a CT to check for specific symptoms such as pain ordizziness. People withcancermay have a CT to evaluate the spread of disease. A head or brain CT is used to evaluate the various structures of the brain to look for a mass,stroke, area ofbleeding, or blood vessel abnormality. It is also sometimes used to look at the skull. A neck CT checks the soft tissues of the neck and is frequently used to study a lump or mass in the neck or to look for enlargedlymph nodesor glands. A spine CT test is most commonly used to detect aherniated discor narrowing of the spinal canal (spinal stenosis) in people with neck, arm, back, and/orleg pain. It is also used to detect afractureor break in the spine. 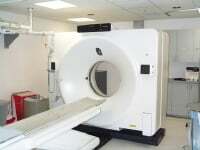 CT scan is a very low-risk procedure. The patient will be exposed to radiation when undergoing a CT scan. However, it is a safe level. The biggest potential risk is with a contrast (also called dye) injection that is sometimes used in CT scanning. This contrast can help distinguish normal tissues from abnormal tissues. It also helps to help distinguish blood vessels from other structures such as lymph nodes. Like any medication, some people can have a serious allergic reaction to the contrast. The chance of a fatal reaction to the contrast is about 1 in 100,000. Those at increased risk may require special pretreatment and should have the test in a hospital setting. Anyone who has had a prior contrast reaction or severe allergic reaction to other medications, has asthma or emphysema, or has severe heart disease is at increased risk for a contrast reaction and is referred to a hospital X-ray department for the exam. Besides an allergic reaction, the intravenous dye can damage the kidneys, particularly if an individual already has marginal kidney disease. Usually, the patient is advised to drink plenty of fluids to help flush the dye out of their system. Any time an injection is done into a vein, there is a risk of the contrast leaking outside of the vein under the skin. If a large amount of contrast leaks under the skin, in rare cases, this can cause the skin to break down. If a patient is going to have a contrast injection, he or she should not have anything to eat or drink for a few hours before the CT scan because the injection may cause stomach upset. To receive the contrast injection, an IV is inserted into the arm just prior to the scan. The contrast then enters the body through the IV. Prior to most CT scans of the abdomen and pelvis, it is important to drink an oral contrast agent that contains dilute barium. This contrast agent helps the radiologist identify the gastrointestinal tract (stomach, small and large bowel), detect abnormalities of these organs, and to separate these structures from other structures within the abdomen. The patient will be asked to drink slightly less than a quart spread out over 1.5 to 2 hours.